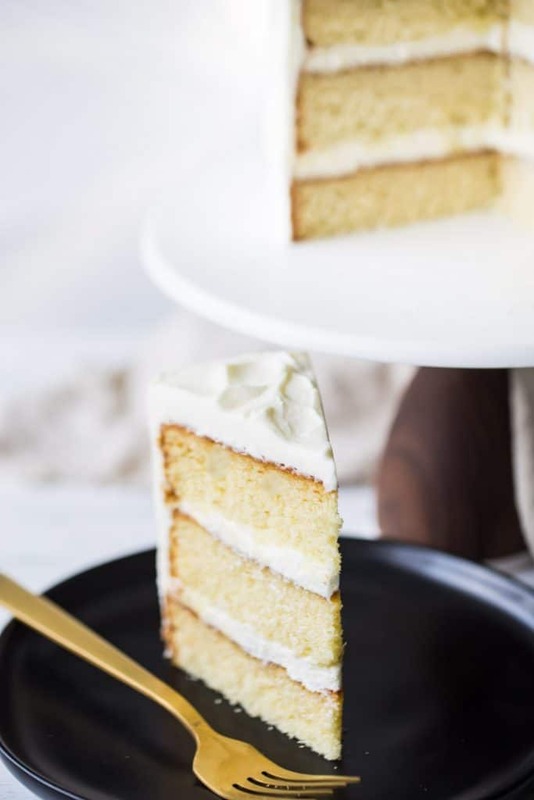 This is the only vanilla cake recipe you’ll ever need! It bakes up soft, buttery, and moist, with a fine, delicate crumb. So easy it’s practically foolproof, and it all comes together in just one bowl. Simple, versatile, and so delicious! There is no better way to celebrate a birthday, holiday, or big occasion than with a gorgeous layer cake. I love to bake cakes and my family loves it too. Some of our favorites include Chocolate Cake, Red Velvet Cake, and Carrot Cake. But lately, our favorite is this simple, perfect vanilla cake. WHY BAKE VANILLA CAKE FROM SCRATCH? I am a firm believer that nothing beats scratch-made. There is something so blow-your-mind fantastic about a homemade dessert that is freshly baked from simple, wholesome ingredients. I grew up mostly on prepackaged desserts and treats made from a mix, but my grandmother used to bake for special occasions. My mom always made a big deal about her from-scratch cakes and would make sure I tasted. She wanted me to see the difference, and I definitely did! It made a big impression and I’ve wanted to bake from scratch ever since. And best of all, I quickly learned that it’s not any harder than using a boxed mix. If you keep basics like flour, sugar, butter, and eggs on hand, and you know how to properly measure ingredients, then you can totally do this! This recipe comes together in just one bowl, so it’s super easy and you won’t have a ton of dishes to wash. No sweat! And you will be amazed at the difference scratch makes. 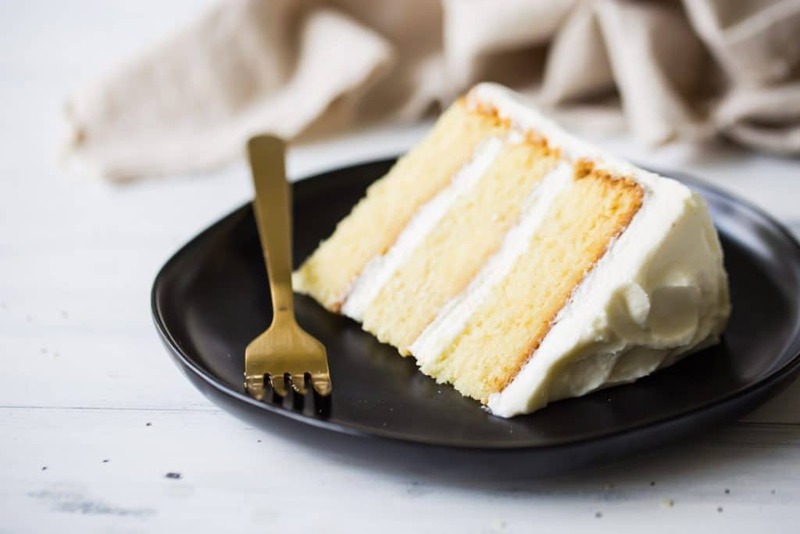 This vanilla cake is so incredibly light, soft, moist, and delicate, and the flavor is off the charts. Buttery, rich, and sweetly perfumed with fragrant vanilla. You’ll never go back to the box! 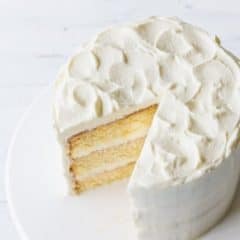 HOW DO YOU MAKE THIS VANILLA CAKE? 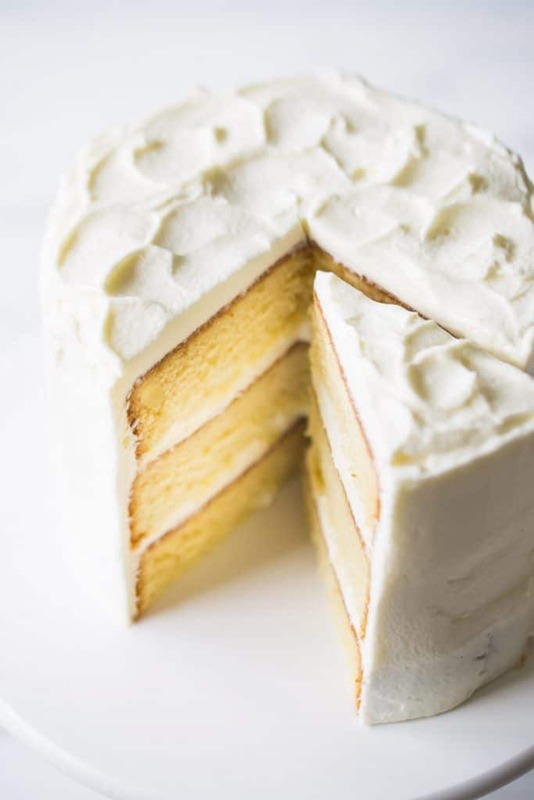 You are going to love how easy this vanilla cake recipe is to make. You only need one mixing bowl, because it utilizes the reverse creaming method. With this method, the butter is incorporated into the dry ingredients, and then the liquid ingredients are added. It’s kinda backwards from what you might be used to! Most cake recipes start by creaming the butter and sugar, and then alternately adding dry and liquid ingredients in batches. But to me that is unnecessarily complicated! It’s really too easy to under-cream the butter and sugar, and too easy to over-mix the batter and cause the cake to be tough. Plus it creates too many dirty dishes. I prefer this method because it’s so simple. Just measure your flours, sugar, leavening, and salt into the mixing bowl, then work in the soft butter until the mixture resembles damp sand. Mix in the eggs, then add the dairy (you can use sour cream or buttermilk in place of the Greek yogurt if you prefer) and vanilla extract, and boom! You’re done. It’s practically foolproof! WHAT FROSTING SHOULD I USE ON THIS VANILLA CAKE? HOW LONG DOES THIS VANILLA CAKE KEEP? I love a good make-ahead dessert, and this vanilla cake is a perfect example. The layers can be baked up to a few weeks ahead, which really helps to take the pressure off when you’re entertaining. Once the cake is baked and completely cooled, wrap the layers tightly in plastic wrap and place them in the fridge. They can stay there overnight or up to a few days. Or, you can freeze them. Slip the wrapped cakes into a zip-top bag and keep them in the freezer for several weeks. When you’re ready to fill, frost, and decorate, it’s so much easier if the cake is cold. You’ll find it’s much less crumbly that way. I like to frost my cakes straight from the fridge or freezer. No loose crumbs in the frosting! CAN THIS VANILLA CAKE BE BAKED AS CUPCAKES OR IN DIFFERENT SIZED PANS? It certainly can! You can find the cupcake version here: Perfect Vanilla Cupcakes from Scratch. As you can see in these pics, I baked my vanilla cake in three 6-inch pans. I just love the look of a tall cake! But if you’d prefer to bake it as two 8 or 9-inch layers, you can totally do that. Just keep an eye on the bake time because a thinner, flatter cake will need less time to bake than a smaller, thicker cake would. I just know you are going to love this vanilla cake recipe! Bake it up for your next big occasion and get ready for tons of compliments! This is the only vanilla cake recipe you'll ever need! It bakes up soft, buttery, and moist, with a fine, delicate crumb. So easy it's practically foolproof, and it all comes together in just one bowl. Simple, versatile, and so delicious! Preheat the oven to 325 degrees F, mist three 6-inch cake pans*** with non-stick spray, and line them with circles cut from parchment paper. Place the cake flour, all-purpose flour, sugar, baking powder, baking soda, and salt in the bowl of an electric mixer, and stir on low speed to combine. Add the butter, mixing on medium-low speed until the mixture resembles damp sand (about 1 minute. Add the eggs, one at a time, scraping the bottom and sides of the bowl to be sure all of the ingredients are fully incorporated. Add the yogurt, milk, and vanilla. Mix on medium speed for 2 to 3 minutes, to aerate the batter and build the cake's structure. Divide the batter equally between the prepared pans, and bake for 30 to 40 minutes, or until a toothpick inserted in the thickest part of the cake comes out clean or with a few moist crumbs. * Learn more about cake flour here: Why Use Cake Flour? ** If you don't have buttermilk, you can substitute by stirring 2 teaspoons of white vinegar or lemon juice into 2/3 cup of regular milk. Allow the mixture to stand for 5 minutes, or until thickened and slightly curdled. *** This layer cake can also be baked in two 8-inch or 9-inch diameter cake pans. The cake layers may bake up slightly thinner, and the bake times may need to be adjusted. Click here for the cupcake version of this recipe: Perfect Vanilla Cupcakes from Scratch. There’s nothing better than a scratch made cake! I absolutely love vanilla cake. I’m not drooling envisioning this cake with some flavored frostings and berry or lemon filling….Yum! So light and fluffy! The perfect cake! I would love to just have a cake-making class with you! What a gorgeous cake! Those layers and frosting are perfect! Such a beeeautiful and simple vanilla cake! A total classic, love it-pinning! i have honestly never made a vanilla cake before my family usually go for chocolate. however this was so easy and yummy… because my son wanted a chocolate cake and a vanilla cake to make up the layers of his cake i substituted the all purpose flour for coco… it seems to have worked a charm… thankyou for such a deliciouse recipe. So happy it worked out well for you Bernadette! If you’re looking for a great chocolate cake recipe, I’d love to suggest this one: https://bakingamoment.com/simply-perfect-chocolate-cake/. It’s one of the most popular recipes on this site! Thanks so much for the positive feedback, and happy belated birthday to your son! Hi! I’m intrested in making this cake for my friend’s birthday, but I was wondering, why do you use sour cream? What does it do to the cake? Also, I don’t have cake flour, what can I use to substitute it? What would happen if I left it out? Hey Stephanie! You can use sour cream, Greek yogurt, or buttermilk. Any of those options should work just fine. Please click the provided link to learn more about cake flour, or enter “Why Use Cake Flour” in the search window at the top of this website. The cake can be stored at room temperature for a day or so, after that it should be refrigerated. Hope that’s helpful! She wants “a moist vanilla cake” but sturdy enough to stack at least 4- 8 inch layers! Before i test this is his crumb sturdy enough to hold that stacked weight, while still being moist? I’ve done it with 3 layers without a problem- I would think 4 should be fine but you may want to dowel it just to be safe! Good luck! Thank you so much for the encouragement! I sure will! I made this cake for one of the most important days of the year, my son’s birthday. The cake was a hit!! It was moist, light and delicious. I was so happy with it. Thank you for a great recipe. So happy you liked it Janna! Thank you for the great feedback & happy birthday to your son! Hi Mariciel! I’m afraid I have not tried that so I can’t say for sure- it seems like it should work but I would think you’d need a little less baking powder. Sorry! I think you’ll just have to play around. This cake is absolutely gorgeous! The texture is spot on being light but moist! I’ve made a practice cake today for my mum’s 60th birthday. I iced with a salted caramel buttercream and it’s just perfect! My new go to vanilla cake! Better than my last though as it’s super low fuss! So happy to hear it Mel! Thanks for the great feedback and PS the salted caramel/vanilla combo sounds amazing! If we dont want to add buttermilk or yougurt or simour cream will the recipe work or not ? Did you have something else in mind that you wanted to substitute? Or are you asking if you can just leave out the liquid entirely? Any idea how many cupcakes this would make? I’ve already made the cake before (it’s my new go to vanilla) but today I need cupcakes. Hey Barbara! I’ve actually linked to the cupcake post in the notes section of the recipe card here, as well as under the heading “CAN THIS VANILLA CAKE BE BAKED AS CUPCAKES OR IN DIFFERENT SIZED PANS?.” Here’s the link again, in case you missed it: https://bakingamoment.com/even-simpler-more-perfect-vanilla-cupcakes/. That’s correct Diane! Standard height cake pans should work. Mine are 2-inches high. Good luck! Every time I’ve made this recipe the sides of the cake collapse! I’ve tried less oil on the pan but I think next time I’ll try none. I made sure not to over beat the batter too. If that doesn’t work I guess I’ll try less milk? I didn’t overbake them and I certainly didn’t over grease the pan this time. If you have any suggestions of how to fix this please let me know. That is so strange! What exactly do you mean when you say the sides of the cake collapse? Like do they fall inward? When I make it the cake does shrink away from the pan as it cools, but I’ve never had the cake collapse unless it was underbaked and lacked enough structure to support itself. But even then it tends to sink in the middle, not on the sides. ??? Great recipe! I also found that my cake collapsed inwardly. The bottom of the cake layer would pull away from the pan about 1/4” while the top of the layer pulled away by about 1/2”. I’m not sure why this happened but it’s no biggie. I’ll be using this recipe again! 🙂 thank you for posting! Happy you enjoyed it! Thanks for weighing in! I made this cake today, in 2, 9 inch pans. I adjusted the cooking time to about 36 minutes and they came out looking great. After I let them cool, they sunk a little in their pans. What did I do wrong? Hey Deborah! So sorry you had trouble! Usually if your cake sinks it’s because it hasn’t been baked quite long enough. A lot of times, it will look really puffy because it’s full of steam. But if it’s still too soft or wet in the middle, that steam will dissipate as the cake cools, and it doesn’t have the strength/structure to keep itself “lifted.” Definitely use the toothpick test because bake times are really just a guideline and every oven is different. Again, I’m so sorry, but hopefully next time you’ll have a better result! I can’t believe you had to scroll all the way to the bottom! That must have taken you ages and I bet your thumb was really sore. Tell you what, when you start your own website and pay all the fees, hire your employees, and devote 50-plus hours a week to providing FREE recipes to your readers, you can put your recipe right at the top and let me know how that works out for you. Good luck and God bless! So happy to hear that Tee! Thank you so much for the awesome feedback! Wow. Amazing. Thank you for sharing. Pairing with custard and chocolate ganach for a boston cream pie cake for my moms birthday. So happy you enjoyed Ty! I actually have a Boston cream pie recipe on this site that does use this recipe as a base: https://bakingamoment.com/boston-cream-pie-recipe/. Happy birthday to your mom! Honestly this recipe deserves a 5 stars. Every vanilla cake I have baked in the past hasn’t quite made it up there but this one is a keeper! That is so great to hear Kyoni! Thank you so much for the positive feedback! Made this cake last night, doubling the recipe so I could get a three layer 8” cake (plus a few teaser cupcakes). It is FABULOUS! I used to think vanilla cake was for bakers lacking creativity… I’m officially a convert, this cake is a winner! Wow, so glad to hear it Crystal! Thanks so much for the great feedback! Which icing recipe did you use for this cake? Hey Kelsey! For the pictures you see here, I frosted the cake with Whipped Cream Frosting. Thank you for this delicious recipe. 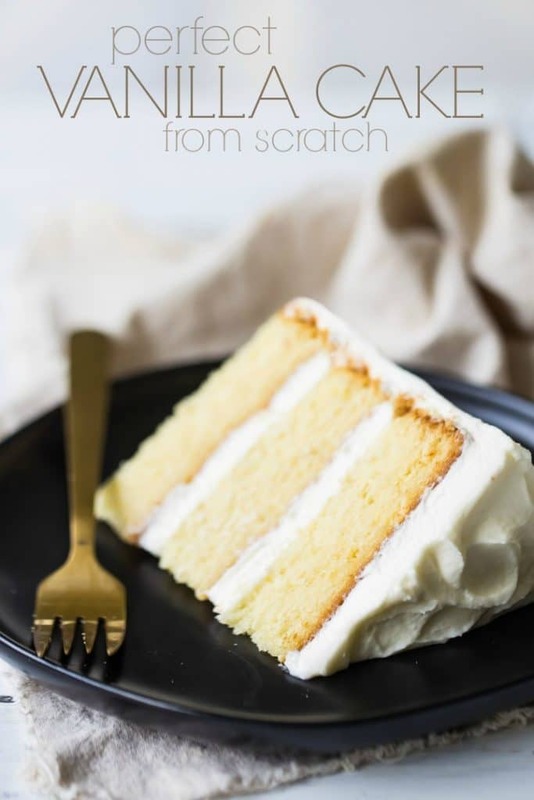 I’ve been looking for years for a perfect vanilla cake recipe and I finally found it. I bake cakes for my kids and hubbys birthday and this will be my go-to recipe from now on. It’s perfect all around (perfectly moist, great texture, delicate and not too sweet). I can’t wait to try your other recipes. Thank you again! I’m so happy you’ve been pleased with it Kana! Thank you so much for the great feedback! Hi, i noticed your butter is 3/4 cup but you wrote that its equivalent to 1 1/2 sticks of butter. 3/4 cup butter is 170g but 1 1/2 sticks of butter is 340g. Im so confused! Hi Jade! I’m not sure where you are getting those numbers from, but the correct amount of butter for this recipe is 3/4 cup. In the US, butter is sold in 1/2 cup sticks, so that would be 1 1/2 sticks of butter. Hi! This recipe sounds really good and I’m planning on making it soon. I just have a few question that I want to ask. 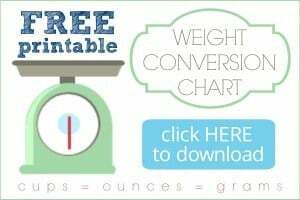 Is it okay if I use less sugar? Whenever I bake cakes from recipes I find online, they usually turn out too sweet, so I’m wondering if the same thing would happen to this cake. I don’t have an electric mixer so would using a whisk and a wooden spoon work for this recipe? Hi Carmen! Thanks for reading and for the thoughtful questions. To be honest I would not recommend decreasing the sugar on this recipe. I know that a lot of times dessert recipes come out overly sugary, but I kind of pride myself on developing recipes that are less sweet. I like to taste the flavor of all the ingredients (the butter, the eggs, etc. ), and not just overpower desserts with a lot of unnecessary sugar. If you use less sugar, you run the risk of a dryer, less moist cake since sugar is hydrophilic and it holds moisture. And you can definitely try making this with just a wooden spoon but your arm will get a good workout! Just make sure that the butter is blended really well into the dry ingredients. It should look almost like damp sand. Good luck and I hope you enjoy! What is the height of the pan? 2 inches or 3 inches? Hi Aron! Either will work- but my pans are just 2 inches high. Hope that’s helpful! Dear Allie, I made this cake with my 3 y.o. on the weekend and it was the best cake we have ever made, by a mile. My in laws run a cafe with a large cake cabinet so I was surprised when my mother in law wanted to bring a piece to work with her for my father in law, but she said they have nothing this nice from any of their suppliers! My son wants to make a “brown” cake next weekend and I just can’t go back to the Hershey’s recipe knowing how much better this cake is, so we will be trying your simply perfect chocolate cake. I compared the two recipes and was interested to note the double quantity of eggs. Can’t wait to try. Thank you so much for sharing, you are an amazing baker!! Wow congratulations Rita on outdoing your inlaw’s suppliers! That’s definitely a win! I’m so happy you and your family enjoyed. Thank you so much for the 5-star review and I hope you like the chocolate cake every bit as much! Your recipes look amazing..I love making cakes with cake flour and it was my first time not creaming the butter with the sugar first…so I was really excited to try this technique out but unfortunately the tasted and smelt doughy..i baked it in two 8 inch pans and baked until the cake tester came out clean..it didnt rise much though I followed the recipe exactly…do you know why that could happen. That could happen if your oven temperature is off, or if your baking powder/baking soda are not fresh. It can also happen if the layers don’t go into the oven right away after mixing up the batter. Sorry you had difficulty Loulou! So happy you were pleased with the recipe! Thank you so much for the 5-star rating! Hi, do you know if using sour cream creates a different texture or taste than using Greek yogurt or is it the exact same? What do you recommend using? Also, do you know if freezing the cake a couple weeks in advance does anything to affect the quality? Do you recommend thawing it before frosting or frosting it frozen? Hi there! I freeze cake layers all the time. Not only does it not seem to have a negative effect, I actually think sometimes it can improve the quality! And I really like frosting a frozen cake because it won’t shed as many crumbs into the frosting. It’s a great technique- I highly recommend it! Hi Nora! Honestly I have never done a side-by-side comparison, but sometimes I make it with Greek yogurt and sometimes with sour cream. Either way I find it delicious! If you like a rich flavor, I would probably suggest sour cream. Or you could use a full-fat Greek yogurt and I think the result would be nearly identical. Baked it yesterday!!!! I must say its the most amazing and easiest recipe I’ve come across!!!!! Divided into 3 parts and added Green and Red colour! Since it’s Christmas time,thought would make it colourful!!! That sounds so fun! I’m so glad you had a good result. Thanks so much for the 5-star rating Manasi! Hi, do you have a fondant recipe you use/ recommend? Can the vanilla cake be baked in a BUNDT pan? My sister made it and baked it in a BUNDT pan and it came out very dense and heavy? Was that why or did something else cause the difference in texture? If you are looking for a bundt cake recipe, I would recommend this one: https://bakingamoment.com/traditional-pound-cake-recipe/. Hey Courtney! If you don’t have cake flour you can just substitute all-purpose in equal measure. Your cake won’t have quite the same fine, fluffy texture, but it will still be really good! What % of milk did you use? Any kind will work but I typically use whole milk for baking. Can this recipe be used as is to make cupcakes? The cupcake version is linked several times throughout the post. Sounds delicious and so nice for spring! Thanks so much for the tips on how to make a bigger cake! Hi, I’m new to baking, can I know the measurements for the ingredients if I’m baking a 10-inch size cake? Hi there! You can bake this recipe in a different sized cake pan if you’d like. The quantity of ingredients need not change, but the bake time probably will. You’ll know it’s done baking when a toothpick inserted in the thickest part comes out clean or with a few moist crumbs. Good luck! Still baking but so far so good! Hope you love it Cecilia! Just wondering if it could go into a jelly roll pan 11×15? I’m needing to make a barn shaped cake, so I thought if I could do two layers of the 11×15 I could obtain the barn. Can’t wait to try this for my son’s first birthday cake! Happy birthday to your son! I think this might work but I can’t honestly say for sure- I have not tested the recipe in that size pan. Sorry I can’t be of more help! Other than kosher salt what should I use? What is the purpose of using kosher salt over table salt? And is this cake firm enough to be handled without falling apart or is it more delicate? I don’t really use table salt at all- it has a bitter taste from the iodine they put into it. This cake is delicate when it’s fresh from the oven but it will become more firm as it cools. I like to refrigerate the layers before frosting. It helps it to hold together better without crumbling.